I'm sat in the dark outside my babies rooms (it's a small hallway and I can touch both their doors if I wanted). I wait for my eldest to go to sleep, she more often than not requests for me to sit here. It used to bother me but now I don't mind as it gives my brain some space and quiet time whilst the smells of dinner waft up the stairs. I then often lean my head back against the cold, hard wall and wonder how on earth I got here! A mother of two energetic and willful children, a woman who is a shadow of her former self. Someone reduced to tears most days by the little ankle biters and who bitterly snipes at her husband when he's 15 minutes late home. He doesn't understand how "oh I lost track of time" rankles me, I'm now a woman who cannot be late, cannot loose track of anything. My life is so carefully timed and mapped out, I need to get where I need to be and I need not to be late. Two little lives hinge on me keeping it all together and keeping the momentum going. I bounce from having the.best.day.ever!!! To having a waking nightmare within seconds and I feel ashamed and emotional that I'm not enjoying every second with them. You get force fed by those who've trodden the path before you that 'these are the best days, you'll miss it when they grow up' but the here and now can be incredibly difficult and surely these people are telling you in hindsight and it's something they missed along the way too. I truly love being their mother and can take the sacrifices I've made to make sure they are cared for. But I sometimes miss me, I miss going out with my husband, I miss being casual and lighthearted, I miss doing exactly what I want and when I want! Maybe that woman will return but I suspect I've changed and will never be the fun loving woman again. 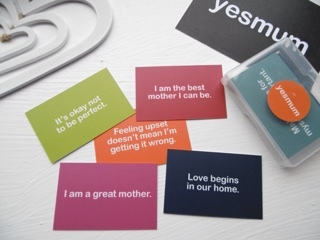 *yesmum cards are the best for motivation. This isn't sponsored, please check them out as I think they are brilliant.